Many areas are mixed environments where suburban communities share public roadways with farms in the rural country. Many developing communities just outside metropolitan areas are built on dirt once used by local agricultural companies that are still farming nearby. Unfortunately, the mingling of passenger vehicles and farm equipment is not always harmonious. There are many farm equipment accidents on public roadways that cause serious injuries and fatalities. For decades, there have been two specific trends in rural development where farm equipment needing to share roadways with passenger vehicles has created a dangerous combination. This includes housing developments popping up in rural areas, where residential homeowners live close to operating farms. In addition, advancements in agricultural equipment technology has increased the size of farm equipment including harvesters, balers and others. This deadly combination has increase congestion on the roadways in rural parts of communities in nearly every state. Farm equipment traveling public roadways often presents dangerous situations when commercial delivery trucks or passenger automobiles attempt to pass the slow-moving vehicle. The number of fatalities and injuries every year in accidents involving the co-mingling of farm equipment and passenger vehicles is on the rise, especially during harvest season. While it may appear that farm equipment operators sharing the roadways are uncaring over the needs of passenger vehicle motorists and commercial truck drivers, they are required to follow the rules of the road. Oversized farm vehicles driving too fast or automobiles recklessly attempting to pass a slow-moving combine harvester, tractor or other farm machinery places everyone at risk. By not obeying the rules, the equipment operator, trucker or passenger vehicle motorists can cause serious accidents with catastrophic injuries or fatalities. 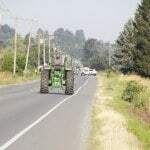 To make matters worse, most farm equipment accidents on public roadways produce devastating results, where the injured parties are many miles away from the nearest trauma center that are usually located in more urban environments. As a result, there is a significantly higher risk to dying from a serious accident involving passenger vehicles and farm equipment in rural areas. Because of that, it is essential to follow the rules of the road to ensure that everyone remain safe, especially around slow-moving farm equipment. If you, or a loved one, are suffering serious injuries after being involved in a farm equipment accident on a public roadway, you are likely able to recover your damages by filing a claim for compensation. However, personal injury cases are complicated and involve complex tort law. Because of that, many victims will hire personal injury lawyers with experience in farm equipment accidents. A skilled legal firm can provide advice on the best options for pursuing an injury claim. The lawyers can determine which parties are at fault, investigate the accident scene, speak to eyewitnesses and develop a strong case for compensation. The lawyer will need to show how the responsible party exhibited reckless, careless or negligent behavior that eventually led to the collision. Rosenfeld Injury Lawyers LLC have assisted many victims of personal injury including those harmed in farm equipment accidents occurring on public roadways. Our years of experience has honed are skills to litigate on behalf of our clients when filing a personal injury lawsuit or claim. Our successful resolutions to claims and suits are the result of proper preparation. Our extensive negotiation skills have helped us settle many claims out-of-court. Our experience at trial litigation has helped us succeed in obtaining maximum compensation for many of our clients. We invite you to schedule an initial, free consultation by calling our law office at (888) 424-5757 today. We look forward to discussing every detail of your roadway collision to assist you in understanding all available legal options to pursue compensation.